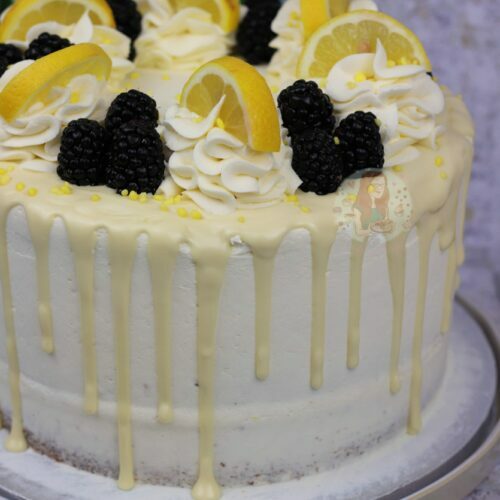 A Three Layer Lemon & Elderflower Cake with an Elderflower Drizzle, and Elderflower Buttercream. So.. you might, or if you have been on Mars, might have not heard… that there is a Royal Wedding coming soon. I’m not sure if it is confirmed or not, but there have been several mentions of the flavour, or one of, being Lemon & Elderflower. I couldn’t resist posting a recipe for this one, whether its used in the Royal Wedding Cake or not. Elderflower is one of my most favourite flavours in the world, but I have only ever really had drinks with the cordials. In cake form? DREAMY. I have made a few Elderflower Cakes in practice for all of this, but mixing it with a dash of Lemon is the best. You ca easily just use Elderflower if you want, and leave out the lemon zest in the cake, but I adore the combinations of flavours. I use one of the Bottlegreen elderflower cordials, but there are so many out there that taste wonderful. Its just such a fresh spring flavour. I decided to use the elderflower cordial in the sponge, along with the lemon zest, and then make it even more Elderfloweree by adding in some Elderflower Drizzle (rather than lemon drizzle) and elderflower buttercream. The Drizzle is basically the same as how a Lemon Drizzle would behave, because its the cordial mixed with some caster sugar. I always use a touch of sugar in my drizzles as I prefer it to just drizzling over the cordial (or lemon) on its own, but thats up to you. 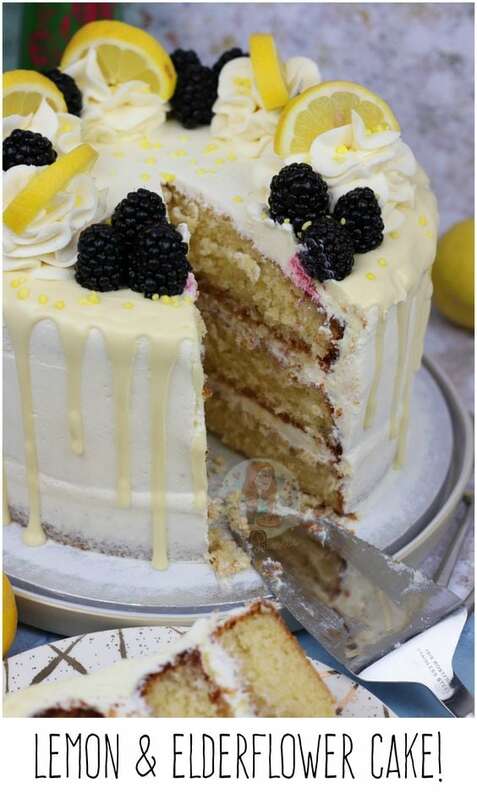 I feel the drizzle keeps the cake wonderfully ~moist~ and it gives it an extra kick of flavour. Drizzles really are the best things when it comes to keeping cakes fresh, and I use them quite often when I want to make a cake last, but with something like this its all about the flavour. 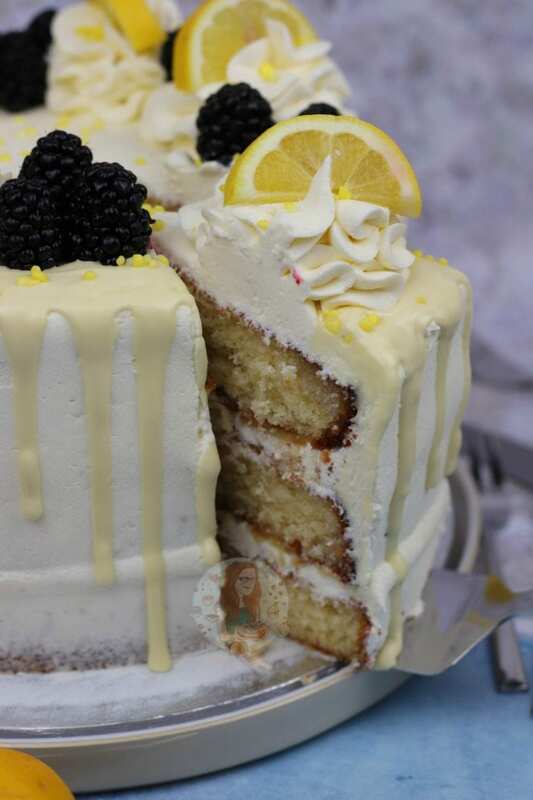 You could try a flavoured elderflower cordial, or stick to a lemon drizzle, but I feel in this particular cake using a lemon drizzle would be a tad overpowering as elderflower is so delicate. I went for the Elderflower Buttercream as I thought it would be wonderful. Buttercream itself is sweet, but in a way adding in the elderflower cordial increases and decreases the sweetness. I don’t personally find cordial that sweet, but I know some people do. Its just as I have said before such a pleasant flavour. You just need to make a usual buttercream, and use the cordial to loosen it instead of water or milk. I obviously went for a drip cake type recipe, as I just couldn’t resist. 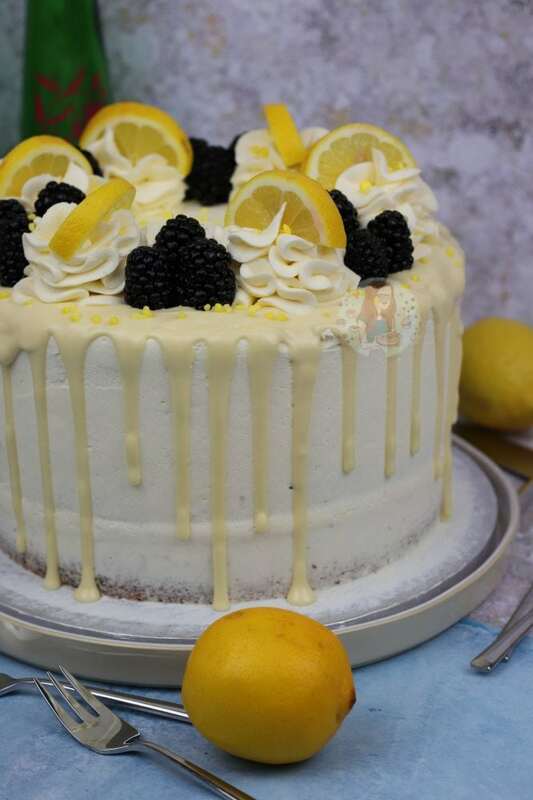 I realise the cake is slopping slightly in the pictures, but it was a tad hot in my kitchen, and I got a little carried away with the lemon curd in the middle.. so my bad. However, I still love how it looks! The pop of colour for the blackberries helps, as the white chocolate drip near enough matches the buttercream. To be fair though, white chocolate and lemon go so well together I had to use it. It tastes soooo good in every slice. In a stand mixer, beat together the butter and caster sugar until light and fluffy. Add in the flour, eggs, baking powder and beat again briefly till combined – try not to overbeat! Add in the elderflower cordial and Lemon zest, and mix in. Whisk together the sugar and elderflower cordial. Once the cakes are baked, drizzle over the cordial mix, and leave the cake to cool in the tin. In a stand mixer, beat the butter with an electric mixer until it is smooth and loose and then beat in the icing sugar 1/3 at a time until its fully combined. Keep beating the buttercream for 5-6 minutes on a medium speed so it starts to get fluffier and lighter. Add in the elderflower cordial and beat again for 3-4 minutes. If its too stiff, add a bit more cordial in, but you want it to be relatively stiff to not slip off the cake! 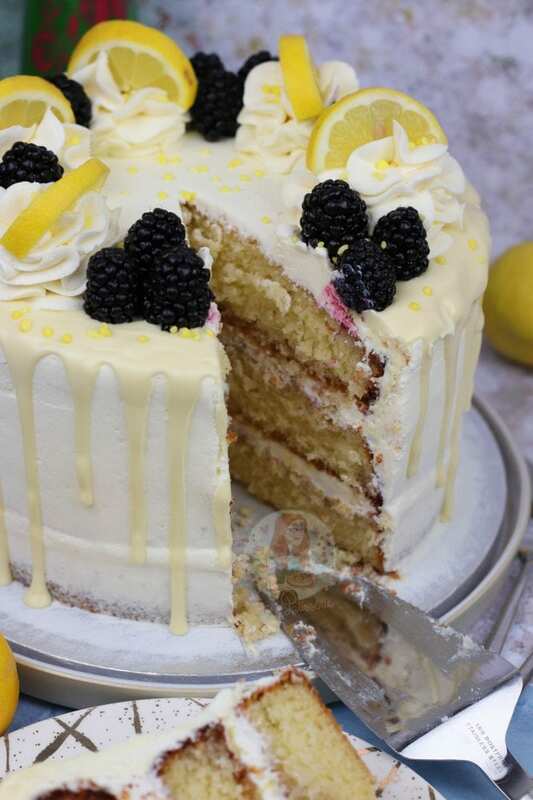 Once the cakes are cooled, put the first layer on the serving plate spread some of the buttercream onto the top of the first layer, spread over a little lemon curd, add the second cake on top, and then top again with some of buttercream, lemon curd, and then add the final sponge layer. Only use about 2 tbsp of buttercream per layer so that you have enough to decorate with! With the leftover buttercream, as you can see, I covered the sides (and top) too! Do a first layer of around the edge and top using a large metal scraper and refriergate for 10 minutes. Repeat again with a slightly thicker layer of buttercream. I slather it on all over using an off-set spatula, and then run the metal scraper round till its smooth. The more you put on, the thicker it’ll be as because you are making it smooth, more comes off than you realise with smoothing it over. Melt the white chocolate carefully. Using a disposable piping bags, pipe it round the edge of the cake, edging over slight bits to create the drip. You don’t need to use too much per drip as it’ll drop quite far down by itself! You can also fill in the top of the cake with melted chocolate as well. 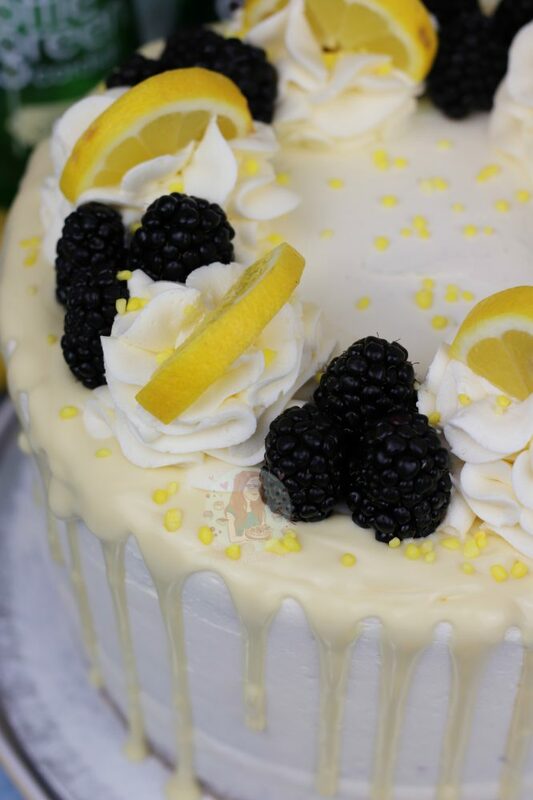 Leave the chocolate to set a bit, and pipe on any extra buttercream, add some lemon slices, and some blackberries if you wish! 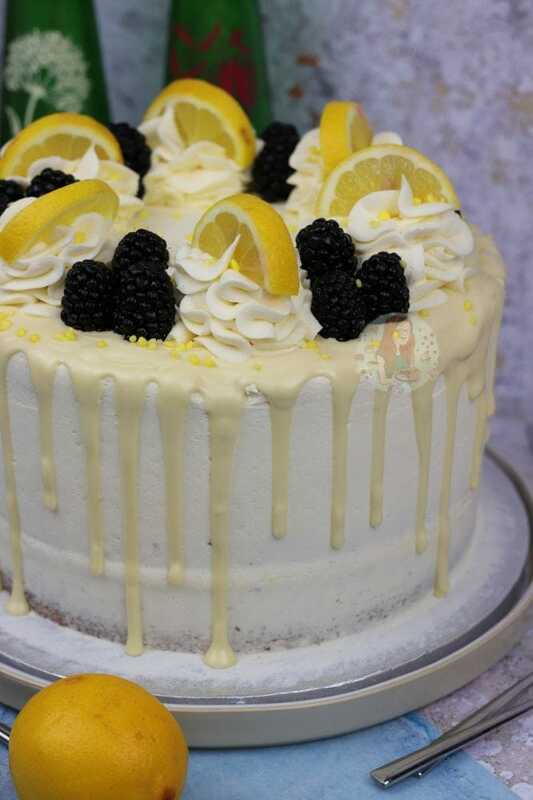 I seriously recommend using a Metal Scraper (affiliate) for the decoration of the buttercream, and the Disposable Piping Bags (affiliate) for the drip... I wouldn't be anywhere without them! I used a Straight ' Twist Twist' Nozzle for the decoration! All of the decorations are completely optional – but I love this style of cake! 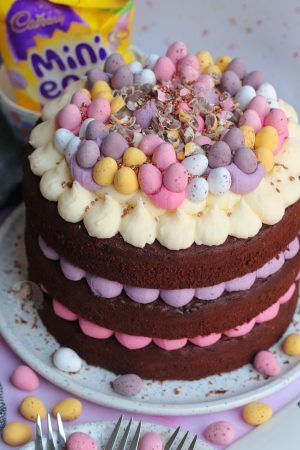 To make a smaller version of the cake, use 300g of everything in the cake, 6 medium eggs, 1 tsp of baking powder, 75ml cordial, and it might take an extra 5-10 minutes to bake and use 2/3 of the decoration recipes! I used white chocolate for the drip, but you can use whatever you like! Or leave it off! 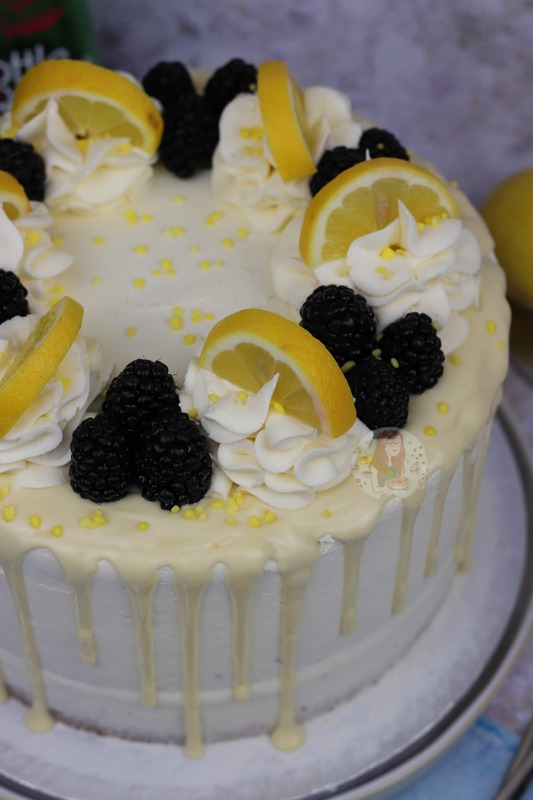 I used Lemon Slices and Blackberries out of personal preference, but feel free to decorate how you please! Older Next post: Baked Chocolate Doughnuts! Newer Previous post: Rhubarb Crumble Cake! Would this recipe work using one deep 8″ cake tin, then split the cake into three once cooked. 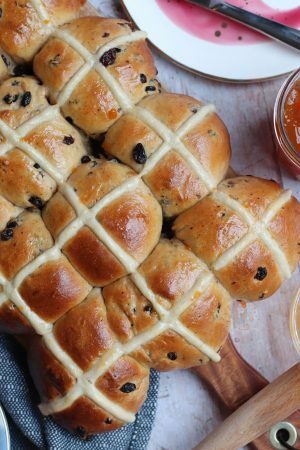 It can – but I would bake it at 140C, and for a lot longer so it’s less likely to dry out! Looks amazing. How would I convert to use a loaf tin please? I’m really looking forward to trying out this recipe! Can I just ask, why does the recipe need self raising flour and baking powder? This recipe would make between 30-35 cupcakes, its best to look at either one of my lemon recipes or the vanilla cupcake recipe, and add the elderflower into that. I made this yesterday, just the 2 layer one, and it has disappeared rather embarrassingly quickly (although half did end up in the ambulance station with my paramedic husband). It is the best of the recipes I’ve made from your blog, which is saying something. Ah thats so cute! And thats so good, a lot of what I bake ends up in a local police station for them all to eat so i’m sure they appreciated it!! This look delicious! I’m due to make this for a friend’s wedding at their request! She’s given me a 10″ cake tin for it and I only need two layers, so would you suggest I keep the recipe the same or halve it? 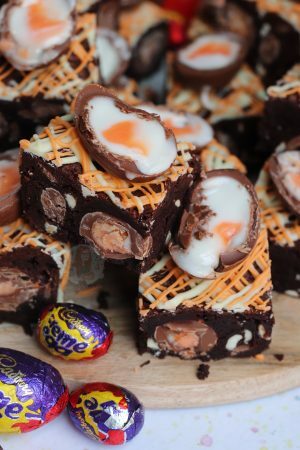 Definitely don’t halve it – for a 10″ cake I usually do 1.6 times the original recipe because its actually considerably bigger – so I’d suggest making this quantity, or even a little more even though you only need two layers. I made this recipe into cupcakes and they were the most delicious cakes I’ve ever made or eaten! The sponge was so light and the buttercream soft and creamy. Everyone that ate them said they were amazing, even my other half who usually isn’t a fan of lemon or elderflower! He asked me to make more! This is one of the best cakes I have ever made – and I’ve made a lot of cakes!! Thank you! Perfect for the Royal Wedding celebrations! 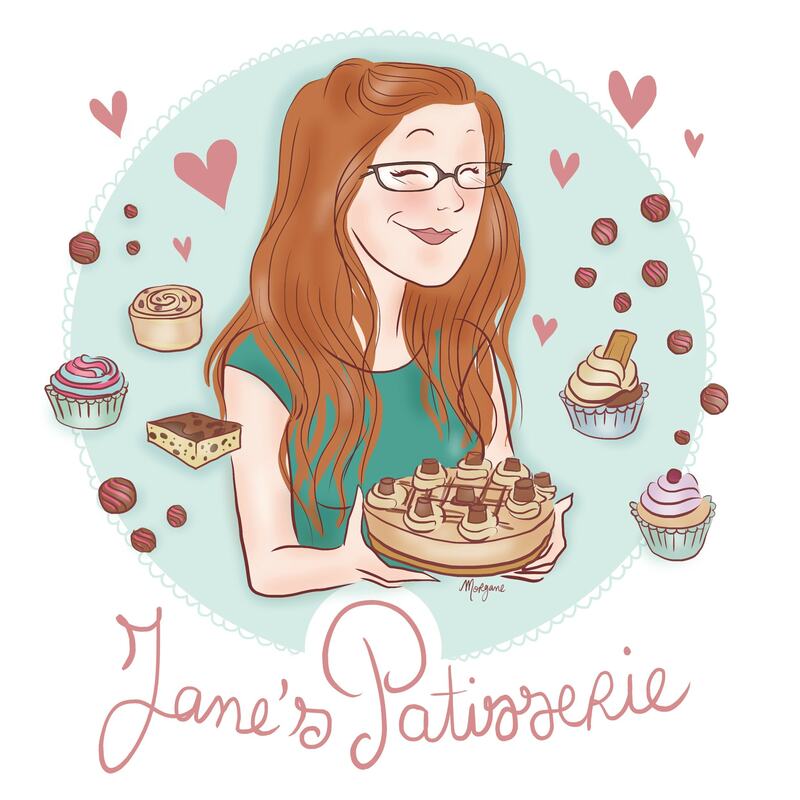 Thank you so much for your fantastic recipes, Jane. 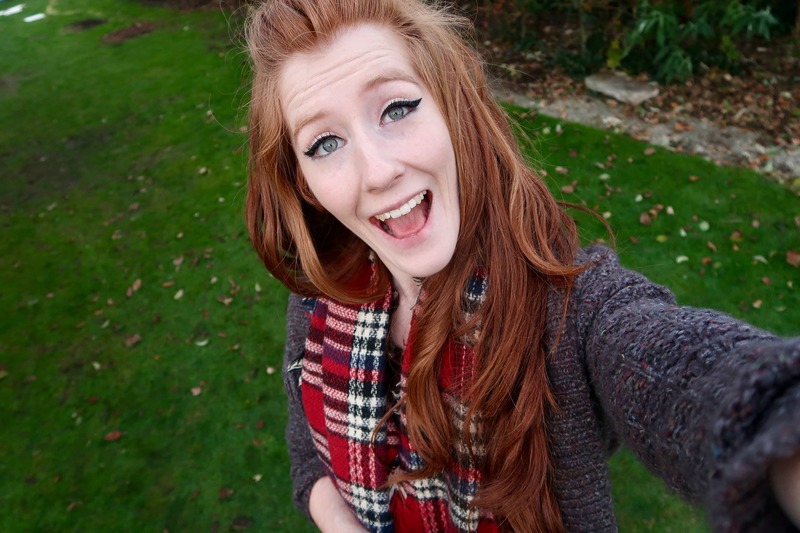 I don’t know WHAT I’d do without your blog! I want to bake this for a friend’s birthday on Saturday. I’ve recently moved to the UK from South Africa & I’m unfamiliar with elderflower cordial. Where can I find it & which brand is good? I’d like to make the drizzle slightly lemony. I love lemon flavour. Could I leave out some of elderflower & replace it with lemon juice? What would you suggest? Elderflower cordial is available in all supermarkets – its like a squash drink. 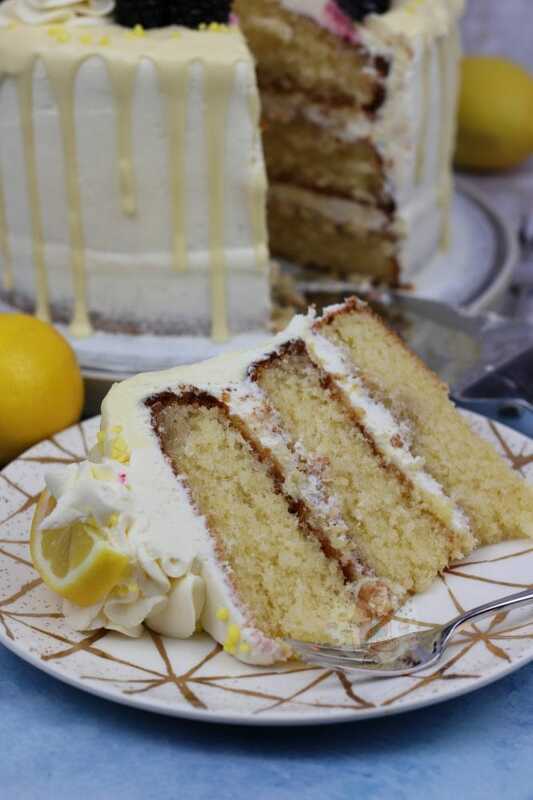 You could use lemon in the drizzle, but it will overpower the elderflower flavour which is a lot more subtle, but thats up to you! Would I be able to substitute St. Germain Elderflower liquor? Would I be able to use St.Germaine Elderflower liquor in this recipe? I’ve never tried it so I’m not sure, but its worth a try! This looks absolutely gorgeous!, I’m so excited for the wedding!. OMG Jane, the Lemon and Elderflower cake is amazing, the sponge is sooooo light. Well done, amazing recipe. This looks amazing – can’t wait to try! Something I’ve always wondered is how do you get your buttercream so white? !